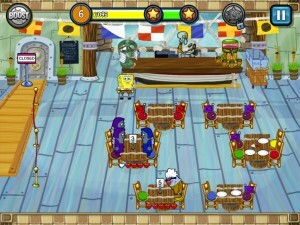 SpongeBob and his friends give new meaning to the term “dine and dash” in this wacky and fast-paced game! Younger children will need help at first but will quickly learn how to play. There are certain shows that I like to avoid watching based solely on the effect that their characters have on my sanity – Spongebob Squarepants is firmly planted in my Top Ten list. He’s been around since I was younger and his voice has always made me want to stuff my ears with socks. Unsurprisingly, my children happen to think the show is hilarious and do a pretty good impression of his laugh. Lucky me. 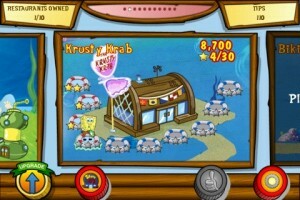 So I was more than a little hesitant when I opened SpongeBob Diner Dash. 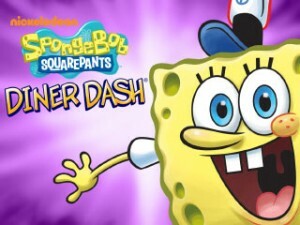 I had played other diner dash- style games before and I really hadn’t enjoyed them, so to add that annoying yellow sea creature to the mix sounded like borderline torture. The premise of the game is pretty easy to follow: Seat customers, take orders, serve food, and clean up, all done in a timely manner. The pace started out slow and easy and word bubbles walked me through the swiping and tapping motion to get customers seated and served. The diners put their menus down when they were ready to order and were given a table number. When Chef Squidward was through with their entrees he placed the corresponding number on the kitchen counter. Diners finished and the table needed to be cleared before the next party was seated, and I received a tip based on the speed of service I provided. The level of diners’ satisfaction was indicated by small red hearts and if there were no hearts I had to speed up or my tip would reflect. As the levels progressed the line to eat got longer and the patience level of diners was diminished. Before the start of each level I had the option of buying extras with my tips that would speed up service or cooking time, or increase the patience of customers. I never did buy any of these, though, because they required a ton of gold tip coins and I played through nearly 9 levels only to afford one boost that I never used. Eventually the tap-swipe-tap-wait-tap motion that repeated over and over (and over) grew really monotonous and I stopped playing out of sheer boredom. Of course I could pay $5.99 to unlock 5 in-app purchase restaurants which would add another 50 tedious levels but I really didn’t like the game that much to spend the money. Once the game play is mastered, advancing through the levels is quite simple for those who have the patience and the diners required constant attention to avoid getting them angry. 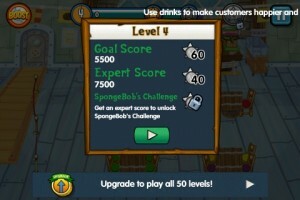 If you or your children are SpongeBob fans and tend to get tunnel vision with games, then I would suggest this free download. Otherwise, save your time.